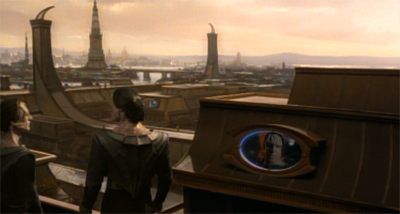 Honour Among Thieves is effectively Star Trek: Deep Space Nine pitching itself as a nineties crime film. One of the luxuries of Star Trek is the sheer flexibility of the format week-in and week-out, the capacity to tell different sorts of stories depending on the tastes of the writers. The franchise can do comedy episodes like The Trouble with Tribbles or House of Quark, political thrillers like Sins of the Father or Homefront and Paradise Lost, weird science-fiction like Whispers or Threshold. The possibilities are endless, the variety incredible. It is a remarkable flexibility, to the point that the audience is never entirely sure what genre they will end up with in a given week. The writers on Deep Space Nine have long been fascinated with the darker side of the Star Trek universe, the pulpy aspect of the franchise that was largely downplayed in the Rick Berman era. Episodes like Necessary Evil played with the conventions of noir storytelling, while Whispers hinted at some postmodern paranoia. The Orion Syndicate were brought back into twenty-fourth century continuity in The Ascent. Occasionally, the strands would come together, most notably in A Simple Investigation, a cyberpunk noir that blended “net girls” with bantering assassins. Honour Among Thieves very much continues along that evolutionary line. It picks up the Orion Syndicate thread from earlier episodes like The Ascent or A Simple Investigation. However, it also positions itself very much in the context of nineties gangster cinema. This is Deep Space Nine channelling Donnie Brasco, casting O’Brien as a mob informant finding himself sympathetic to his target. Miles ahead of the enemy. Although it set in modern day Atlanta, director John Hillcoat seems to frame Triple 9 as a grim companion piece to The Road. Hillcoat captures the horrors of urban decay, creating a world that seems to teeter on the edge of the abyss. The camera pans through abandoned tenement buildings and lingers on graffiti; bodies are found in shopping trolleys while tinted windows serve to conceal immediate dangers. As filmed by Hillcoat and filtered through the lens of cinematographer Nicolas Karakatsanis, Atlanta seems to be composed of slums and overpasses. From the impressive opening heist set piece, Hillcoat saturates the film with red, as if our heroes are only glimpsed through the light of hellfire. That red comes from multiple sources; a red dye pack that explodes at the worst possible moment, the boots worn by one of the characters, the lights from a police car, the fire from a distant (and somewhat anticlimactic) explosion. Triple 9 is oppressive and grim, with Hillcoat threatening to bring the world collapsing down upon his protagonists. The problem with Triple 9 has nothing to do with Hillcoat’s aesthetic. Instead, the film suffers from a generic and unfocused script populated by characters who lack agency and identity. The main figures in Triple 9 often feel like pieces of paper caught in a breeze, moving in any given direction at the whim of the plot rather than through any essential quality of their own. Things happen not because they are organic (or even inevitable), but because they are convenient. There are points at which it seems like maybe the characters are not in hell; maybe the audience are. Nostalgia is the last “serial killer of the week” story produced by Millennium. Sure, there is a serial killer in Via Dolorosa and Goodbye to All That, but the last two episodes of Millennium are much more interested in the show’s mythology than in a nuts-and-bolts “Frank catches a serial killer” story. Appropriately enough, given its title, Nostalgia feels like a throwback to a simpler version of Millennium. In a way, it does more to capture the mood and feel of the first season of the show than anything like Matryoshka or Seven and One. It helps that Nostalgia is a great episode, judged by it own merits. It makes sense that Nostalgia should come from Michael R. Perry. With his debut script for The Mikado in the second season, Perry had demonstrated quite a knack for traditional Millennium storytelling. The Mikado was arguably something of a throwback itself, the most old-school “serial killer of the week” story in the show’s delightfully off-kilter second season. If the show wanted to do one last “serial killer of the week” story, there was no writer better suited to crafting it than Michael R. Perry. In a way, Nostalgia feels like belated vindication for the “back to basics” aesthetic running through the third season – proof that perhaps it might be possible for the show to recapture some of the stronger aspects of the first season even this late in the game. Nostalgia is a much better version of the stories that Closure and Through a Glass Darkly had tried to resurrect earlier in the year. It might be enough to entirely redeem the season’s stubborn fixation on a past fading into history, but it does demonstrate that there were interesting stories to be told using that technique.